First Line: My computer is winking at me knowingly when I sit down at my desk. When a tiny skeleton is discovered buried on the grounds of an old house that's being demolished, journalist Kate Waters knows that this is a story that deserves much more attention than a throwaway sentence or two in her newspaper. As she investigates, she finds connections to a sensational crime that happened decades earlier: a newborn baby was stolen from the maternity ward in a local hospital and never found. But Kate learns that there is even more to the story, and she is quickly drawn into the lives, and the pasts, of the people who once lived in the neighborhood. Ultimately becoming the keeper of three women's secrets means Kate is constantly walking the tightrope between what she can and cannot tell. 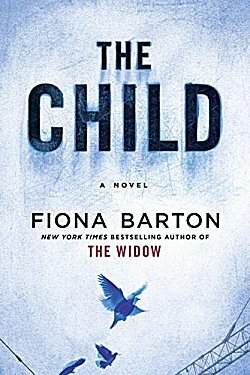 Fiona Barton's The Child is a story that rapidly draws you in and won't let you go until everyone's secrets have been revealed. The style of this book is reminiscent of Kate Atkinson in the manner in which the story unfolds. Told in alternating chapters by Kate and the three women involved-- Angela, Emma, and Jude-- the voices may not be particularly distinctive, but their stories kept me guessing clear through to the end. Barton definitely has a knack for creating memorable characters and strong storylines. I can't wait to see what she comes up with next. Hmmm. I don't know. The Widow was very disturbing, including the fact that a woman was increasingly suspicious of her husband, yet was passive. It felt so old-fashioned and that status of the woman was so submissive to her controlling spouse. Classical psychological domestic abuse? Don't know, but it was creepy. How is this book? Do I need the lights on and my neighbor's dog to read this? I know what you're talking about in relationship to The Widow, and there's really none of that here. There is a completely self-absorbed character that I mentally strangled every time she had her chapter, but fortunately her chapters were fewer in number than the others. I've been hearing lots of good things about this one, Cathy. I actually ought to pay more attention to Fiona Barton, as she's quite talented. I appreciate the reminder of her work! I'm looking forward to seeing her at The Poisoned Pen in July. Your visit to the Poisoned Pen to see Fiona Barton should be very enlightening. Look forward to reading the write-up.